What is Mako Robotic Arm-Assisted Technology for Partial Knee Replacement? A partial knee replacement is a procedure performed by an orthopaedic surgeon meant to alleviate pain caused by joint degeneration due to osteoarthritis within the knee. Mako knee replacements make use of robotic arm technology which assists doctors in pre-operational planning and in operations themselves. The robotic technology allows doctors to achieve a higher level of precision and accuracy during knee replacement surgery. Not all people who experience knee pain from arthritis and joint degeneration are candidates for Mako robotic knee replacements. A large percentage of people experience arthritis-related discomfort in waves. Every injury and circumstance is unique. For that reason, it is advisable to make an appointment with a doctor to know what treatment plan is best for you. Mako robotic technology assists doctors both in pre-operational planning and in the operation itself. Before the procedure, a CT scan will be taken of the patient’s knee and then uploaded into the Mako software. The software then creates a 3D image of the knee, which allows the doctor to plan the knee replacement surgery with extreme precision. During the procedure, the doctor will guide the Mako robotic arm within the area of the knee that has been pre-defined in the 3D scan. This allows for the doctor to be precise with regard to the boundaries and goals of the operation. 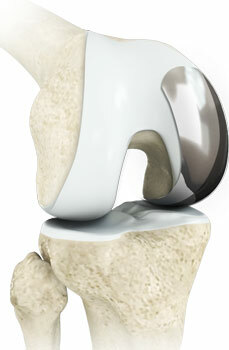 Insertion of implants within the knee is improved with Mako technology. Mako robotic partial knee replacements are procedures designed for adults who are suffering from osteoarthritis that has not yet spread to all three sections of the knee. Depending on the specific condition, patients may receive one or more of these different kinds of implants: Bicompartmental, Medial, Patellofemoral, or Lateral. Patients considering partial knee replacements should keep in mind that the Mako robotic technology is not at any time in control of the procedure. The doctor uses the robotic arm for precision during the operation and is at all times in control of its movements. The software is such that if any adjustments need to be made during the course of the procedure, the doctor can make them as he or she goes. General indications: Partial knee replacements are procedures geared toward adults who experience progressive osteoarthritis and degenerative joint disease within the knee. Contraindications: Partial knee replacement surgery is not suited for people with certain kinds of infections, mental or neuromuscular disorders which can cause prosthetic instability or failure, in addition to people who experience postoperative complications, with comprised bone stock, skeletal immaturity, or obesity. Common side effects of partial knee replacement surgery: Knee replacement surgery carries risks associated with most other surgeries, which include but are not limited to, nerve damage, deep vein thrombosis or clotting, infection, blood loss, changes in blood pressure, pulmonary disorders, heart attack, and death. Risks associated with implant implementation include possible dislocation, loosening, fracture, nerve damage, implant wear, metal sensitivity, progressive bone loss, and negative reactions to particle debris. Compared to a total knee replacement, the implants used in partial knee replacements may feel or perform the same as healthy knee joints. The Mako procedure for knee replacement can often be completed in as little as one hour and can be done in an outpatient setting. The precision planning the technology before the operation generally makes way for less time in the operating room. However, all cases and injuries are different, and it may be the case that once the operation begins, adjustments will have to be made. It is important to discuss all particulars with the surgeon in the time leading up to the procedure. Partial knee replacement recovery time depends on the case and the complexity of the operation; however, patients are often allowed to bear weight immediately after surgery. Many patients are able to return to activities like driving within two weeks of surgery. The Mako knee replacement recovery period is thought to be about 30 percent quicker than surgeries unassisted by the technology. Within 5-6 days of the procedure, patients will be encouraged to achieve 90-degree flexion in the knee, and ability to perform a straight leg raise. After 3 weeks, patients should hope to achieve 120 -degree flexion. At 6 weeks after surgery, knee flexion should be as little as 80% of what is expected for the final outcome, and patients will be able to return to work and progress off of any assisted surface devices. Muscle strengthening exercises will be recommended at this time, monitored by a physical therapist, to bring patients’ leg strength and movement back to full or near-full ability. Patients will generally be able to use the treadmill, elliptical, or swim at this time period.